Over 600 people came through the doors at the opening weekend of the Prescot Festival. 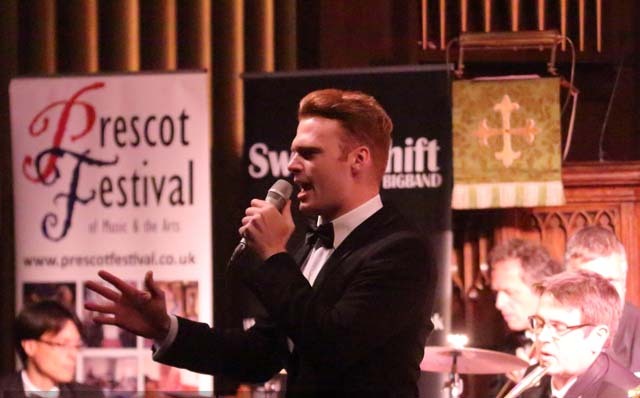 Swingshift Big Band and vocalist Chris James launched the 2016 festival in style on Friday, with an evening concert paying tribute to swing legends Glenn Miller and Frank Sinatra, who would have been 100 this year. Saturday began reflectively, with an afternoon of events remembering Prescot’s role in the two world wars, including a Q&A with a former prisoner of war and ‘Prescot War Memorial at 100,’ a talk by historian Stephen Nulty. The day ended with a moving performance of Mozart’s celebrated Requiem, performed by a ‘come & sing’ chorus of almost 100 singers from across the region, with Liverpool Metropolitan Cathedral’s James Luxton conducting. 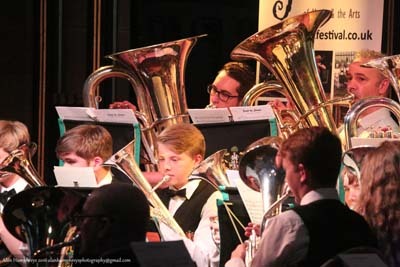 The brilliantly talented Wigan Youth Brass Band delivered a stirring second half to the concert. On Sunday, Nigel Ogden of BBC Radio 2’s The Organist Entertains played to an appreciative crowd, while nearby the town council-organised Prescot Carnival attracted hundreds more visitors—not withstanding a soggy close to the afternoon—on top of the 600 already attending the festival. The programme continues throughout the week before a closing weekend that begins with a Barn Dance and Hot Pot Supper on Friday night. Saturday sees LJMU scholar Elspeth Graham speak about ‘Shakespeare and Prescot,’ and an evening concert featuring Songs from the Shows with BOST, one of the North West’s best musical theatre companies. “We’re incredibly proud to be going so strong in our twelfth year,” said Artistic Director Dr Robert Howard. “The quality of skill and talent on display only seems to increase year on year, and we’ve been overwhelmed by the success of this year’s festival so far. 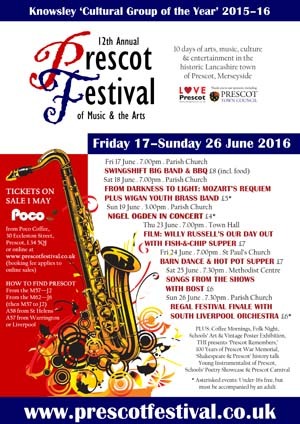 Full details of the programme for the 12th Annual Prescot Festival of Music & the Arts are online at www.prescotfestival.co.uk.